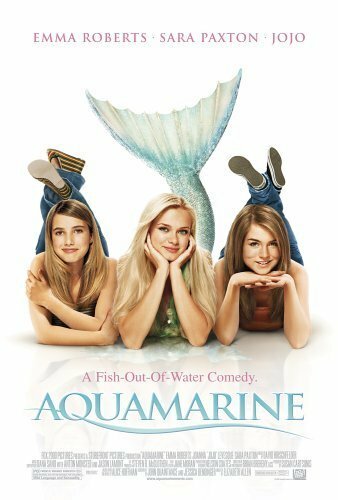 Aquamarine is an American-Australian co-production 2006 film starring Joanna "JoJo" Levesque, Emma Roberts and Sara Paxton. The film, which was made in both the United States and Australia, was released in North America on March 3, 2006. The movie, loosely based on a children's book on the same name by Alice Hoffman, and directed by American director Elizabeth Allen was filmed in Queensland, Australia. Two teenage best friends, Claire (Emma Roberts) and Hailey (Joanna "JoJo" Levesque) regret that they will be separated in five days, since Hailey has to move to Australia because of her mother's job. One night, after a violent storm they find a mermaid named Aquamarine (Sara Paxton) in the swimming pool of their beach club. The girls are frightened at first, but then curious. They start to talk with Aquamarine and promise her they will be back in the morning. When they return, they find Aquamarine in the beach's snack shack, but with a human body instead of a mermaid's. Aquamarine tells them she can assume human form on land during the day if she does not get wet. Claire and Hailey bestfriend Aquamarine, who tells them that she came to land to find love, an idea she knows nothing about, but desires desperately. She tells them that she made a deal with her father: if, in three days, she proves to him that love exists, she will not undergo an arranged marriage. She immediately notices a handsome lifeguard named Raymond (Jake McDorman) -whom Claire and Hailey have admired for awhile- and enlists the help of the two girls to win his heart in return for the granting of a wish. The girls see their opportunity to keep Hailey from moving and immediately start helping her.